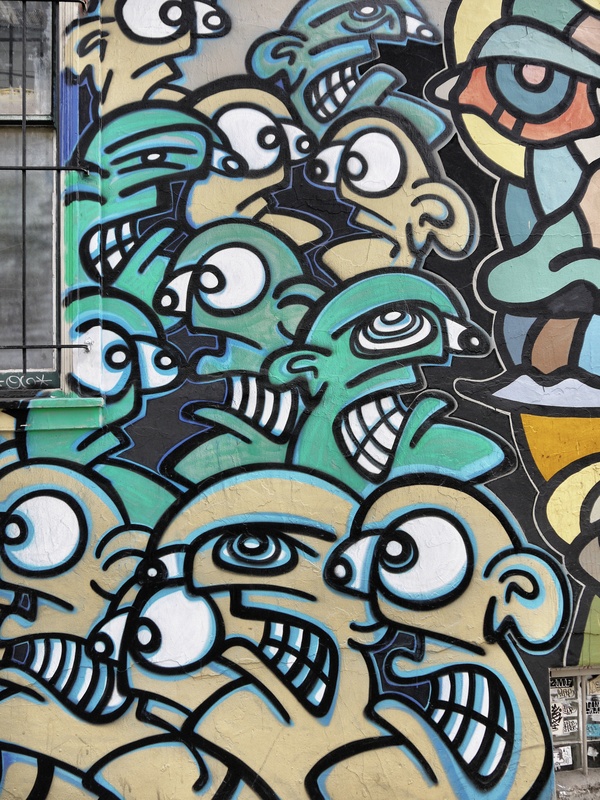 The madness of crowds (sourcing)? Contests are seen by many in the social sector as a way to engage audiences and generate new thinking about important issues, yet in generating all of these contributions from the crowd are we undermining the very aims of work in social innovation when the fruits of these ideas largely remain to rot on the vine and what is the true cost of harvesting them? After years of watching and participating in this stuff, I’ve concluded that it does more harm than good—and by “this stuff” I mean the whole contest/challenge/prize/award industry. Yes, this lumps together way too many disparate things; yes, there are exceptions to everything I say here; and yes, it deserves a more nuanced discussion. That’s all true, but on the whole, I think we could dump it all and not miss a thing. It wastes huge amounts of time. There is way too much emphasis on ideation* and not nearly enough on implementation. It gets too much wrong and too little right. It serves as a distraction from the social sector’s big problem. Starr makes reference to a scenario posed by futurist Thomas Frey who comments on the false wisdom of crowds by considering the idiocy of having crowds vote on how to fly a plane as it was en route as a way of democratizing the experience of flight. Crowd-based anything seems to be popular. With the rise of behavioural economics, social network influence maps, and the popularity of crowd-enabled funding projects proliferating there is much to be found for those looks at how the ‘wisdom of crowds’ . The popularity of opinion-based journalism reveals that you need not have to know much about anything you’re talking about, just having an opinion matters. Indeed, we are asking people for their opinion on things they know nothing about, yet are making enormous decisions based on feedback. This is not about experts vs novices, it’s about knowing when expertise or more information is needed and when new, fresh thinking is necessary. The two aren’t always incompatible, but there is a place for knowing what information to trust, when and where. The madness of crowd enthusiasm has lost this subtlety. The current enthusiasm for crowdsourcing innovation reflects this fallacy that ideas are somehow in short supply. I’ve watched many capable professionals struggle to find implementation support for doable—even proven—real-world ideas, and it is galling to watch all the hoopla around well-intentioned ideas that are doomed to fail. Most crowdsourced ideas prove unworkable, but even if good ones emerge, there is no implementation fairy out there, no army of social entrepreneurs eager to execute on someone else’s idea. Much of what captures media attention and public awareness barely rises above the level of entertainment if judged by its potential to drive real impact. There is this common notion that ideas will change the world. That’s nonsense. Doing something with a good idea is what changes the world. It’s what Seth Godin and Scott Belsky and his group at 99u have been pushing: it’s making ideas happen that counts most. The world has never been changed by inventions that were left solely in people’s minds. Putting ideas out into the world also allows for their critique and other types of innovation through additive elements, iteration and prototyping. Ideas themselves are plentiful, easy to cultivate and a seed, not a tree. There is a crowd of cheerleaders that presume crowdsourcing ideas or problem-solving will work for almost anything and that is a myth. Much of the data on effective crowd-based decision-making points to very specific circumstances and where there is an ability to average decisions. Thus predictions of movement or assessment of quantity or dichotomous outcomes are all good areas for crowdsourcing. But what has happened is that this effective use of crowds to make sense of large phenomena has been over-extracted to areas it is less adept at dealing with. There are also processes that facilitate effective ways to engage crowds to get better data. Contests play into this mindset when they seek the ‘best idea’ from many on issues where very often people are ill-informed about the scope of the projects. Some might argue that enlisting many people’s involvement in a topic is still good value because it gets people thinking about an issue. This might be true for some things, but does that thinking produce any change in something else? Starr points to another recent work by the Knight Foundation that looks at the energy that went into its contests and the wider impact that it saw when it stepped back at looked at the contests winners and losers in its totality. The Knight Foundation recently released a thoughtful, well-publicized report on its experience running a dozen or so open contests. These are well-run contests, but the report states that there have been 25,000 entries overall, with only 400 winners. That means there have been 24,600 losers. Let’s say that, on average, entrants spent 10 hours working on their entries—that’s 246,000 hours wasted, or 120 people working full-time for a year. Other contests generate worse numbers. I’ve spoken with capable organization leaders who’ve spent 40-plus hours on entries for these things, and too often they find out later that the eligibility criteria were misleading anyway. They are the last people whose time we should waste. And it’s exploitive. For social sector organizations, money is the oxygen they need to stay alive, so leaders have to chase prizes just like they do other, more sensible sources of funding. Some in the industry justify this as a useful learning process. It’s not. Few competitions (with some notable exceptions) provide even the most rudimentary feedback. Too many of these contests and prizes seem like they are more about the givers than the getters anyway. If we are looking at creating impact perhaps we need more systems thinking and design thinking about what it is we are intending to produce and how we can better design our initiatives to produce them. Otherwise, we’ll create much creative noise, very little innovation signal while reducing the impact of the system as a whole in the process. * Starr uses the word ‘innovation’ in the original text, however my definition of innovation is one that necessitates implementation — you must actually do something different than before to innovate, not just have a good idea. It requires some rearrangement of the social and technological relationships to the product or service being designed. Seth Godin, a business and marketing thought-leader and someone I’ve written on before, posed the question on his blog: Are marketer’s responsible for what they promote? Are you responsible for what you market? Let’s assert that marketing works. If it works, then, are you responsible for what happens after that? If you market cigarettes aggressively, are you responsible for people dying of lung cancer? 1. You’re not responsible. The marketer is like a lawyer representing the obviously guilty client. Everyone is entitled to a lawyer, and it’s up to the jury to decide. The lawyer’s job is to do the best she can, not to decide on the outcome. Market the best you can and let buyers take responsibility. 2. You are responsible. Your insight and effort cause people to change, and without you, that change would never happen. My take: if you’re not proud of it, don’t sell it. As I mentioned in a previous post, social marketing in the health sector (not including the ‘miracle cure’ hawkers) tends towards promoting “healthful” things. Yet, even these supposedly healthful activities such as donating to a particular cause, paying attention to certain lines of evidence, or attending certain educational events have unintended consequences. Donations to one charity means that money isn’t going to others. Adhering to certain protocols and procedures means disregarding or not paying attention to others. While choosing to attend certain events takes you away from other activities you could pursue (like your email back at the office, meetings with colleagues, time with family, or attending other events). While the above example of cigarettes might lead us to an obvious answer to Seth’s question, what about what happens in our knowledge translation activities on the side of health? Do we stop to consider the unintended consequences of our actions, even if they are well intentioned? Systems thinking is one of the tools to help us through this, particularly systems dynamic modeling. On an individual level, contemplative inquiry is another strategy. In both cases, we need time, care, attention and the capacity to bring this knowledge to light. One example is with the Transtheoretical Model and Stages of Change theory. When I started getting into the health field Stages of Change was just gaining popularity. A search of PubMed finds nearly 1000 published articles using variants on the Stage of Change concept. In a nutshell, this theory suggests we work our way up to change by planning over time towards a change. Local, provincial/state, and national programs throughout the world have taken this approach to organizing their activities. For a while it seemed that the only way to get funded was to have some accounting of stage. The problem was, Stage of Change does a lousy job of predicting change in certain behaviours. Robert West and others looked at the evidence and found that in many cases, Stages of Change did a terrible job of predicting whether people would change their behaviour or not, particularly in the realm of addictions. Smokers or problem drinkers might stop “cold turkey” without any advance planning, which isn’t well accounted for by the model. Yet, the model, so ingrained in the psyche of many health promotion planners and educators, continues to be used widely, blinding us to other options. The unintended consequences of this is that we are often unable (unwilling?) to consider that other models might work. Or, that the models we have don’t work as well as we’d hoped and that maybe we need new ones. By not only putting these ideas out there, but actively promoting them, we are marketing not only products, but ways of thinking about problems and it is here that we get into trouble. Pride in what you do might avoid the problem’s that Seth Godin in talking about, but when it obscures our vision from considering other options, it might be time to do less social marketing and more social systems thinking. How Much Marketing Can We Take? This week at the CoNEKTR Lunch and Learn at the Dalla Lana School of Public Health, the focus of discussion was on knowledge translation and the theme I discussed in a previous post. It was a lively discussion and one that emphasized the limits that one hour and many great minds presents for exploring a big topic like KT. The discussion around the room focused on the challenges of taking what it is we know and transforming it into practice, policy and research innovations that work in the everyday. While the subtext of the presentation was initially focused on systems issues, building on Russell Ackoff‘s phrase about “doing the wrong things righter”, the bulk of the conversation was on whether or not we are dealing with issues that have to do with marketing and simply being better at it. That is, if health sciences just got better at packaging the materials they produce, delivering them more effectively (or more often) and doing so by understanding the user better, things would get done. One could view this argument as proof positive that as a field, we are so wedded to the idea of shoveling content that we no longer see that this is just doing different versions of the same thing over again. But a closer look suggests that social marketing might provide us with a middle ground between the largely content-driven approach that dominates the literature (which suggests that if we just package the best content better, people will listen to what we say because it is, after all, the best content) and a systems change approach that looks at redesigning the way we interact with knowledge and produce it in the first place. A finer look at marketing suggests that there is something different from the traditional view. A marketing perspective is less concerned with the quality of the product (i.e., content) and more about process of how to get this content to people and get them to use it. The crassest example of this can be seen in episodes of Mad Men and how they brazenly craft messages around toxic substances like cigarettes to seduce people, fictional representations of the very real world work of the tobacco industry does to reach youth , racial minorities and women alike. But unlike the callous marketers who don’t care about their audience’s health, health professionals very much do. And so do some marketers. By focusing on the process of getting information to the intended audience, a marketing perspective gets closer to the spirit of what knowledge translation is intended by some definitions. What it fails to do is question or even challenge the underlying structures that create the barriers to knowledge application in the first place. Emphasis on clever, creative means of getting around these barriers is a start, but just a start. The supposition here is that people are simply distracted or busy and that they are not able to attend to the messages around them due to volume. This has some merit. 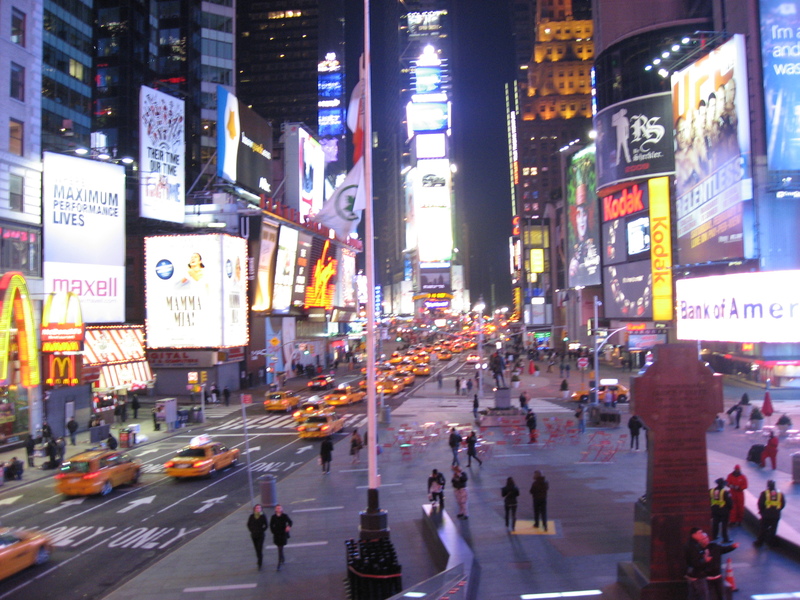 As anyone active in social media use, spent time in front the TV, visited a “free” website, or having visited public places like Times Square (pictured) can attest, the volume of information we get exposed to on a daily basis is enormous. It sounds good, but as any marketer can tell you, today’s effective and innovative strategy is tomorrow’s overused, ignored delivery system. Once widely adopted, a marketing strategy often loses its lustre and something new must replace it, which is why marketing is such a dynamic field. A systems-oriented approach is also dynamic, but one that aims to transform the structure of the relationships and processes within the system rather than work around the existing ones. Perhaps the question is less about whether social marketing is knowledge translation, but whether social marketing is enough given the information climate most health professionals and consumers exist. Seth Godin‘s recent book throws out the challenge to its readers to be indispensable in the jobs that they do. This is a tall order for most, but Godin points to ways of thinking, approaching problems and examples of how even the most mundane, mechanical jobs can be more when we bring the best of ourselves to what we do each day — no matter what the job is. He wants us all to reclaim our genius. The message is an unusual one in that it applies very well to individuals — you and me — but is a lot harder to apply at the organizational level. This is an important issue for those wanting to create better, healthier systems and it is here that the role of individual and system can get confounded. A well managed company does not allow itself to become dependent upon the performance of any single individual. Those individuals who attempt to hoard knowledge, relationships, or resources to attain job security should not to be valued or viewed as indispensable, but should be admonished as ineffective and deemed a liability. Corporate talent that cannot be shared, duplicated, distributed, or leveraged is not nearly as valuable as talent that can. It is here that I first disagree. Godin is not advocating for valuing the hoarder, rather he is suggesting the opposite: unparalleled sharing and generosity. Someone who hoards will not advance system change: period. Systems rely on exchange of information and intense conservation of knowledge or information reduces the response capacity of a system (which could be an organization). An organization that relies on a hoarder for survival hasn’t been paying attention or created processes of openness that allow information to move through the system. If you have a hoarder, one needs to ask: how did we create an organization that enabled that person to become so important? How can we transform it so that person’s unique talents can come out and that knowledge that is sharable and distributed gets to whomever it needs to when its needed? Regarding point 1: What would one promote themselves to? This pokes a hole at the dominant model of organizational development that suggests that promotions work vertically (including the entire thinking about why we need directions to move, embedded in the term “promotion”). When you’re the best salesperson on a team doing something you love and are good at and you get a “promotion” does it mean pulling you off the sales team into a management position, which may rely on a completely different skill and mindset? Does this really make sense? Regarding point 2: If you have a real linchpin, your task is creating a dynamic, exciting environment to let them do their thing well. After all, they are linchpins precisely because they are good at what they do. You’re always in an “untenable position” of not being able to replace them because they are, by definition, unreplaceable. Do you have a work culture that brings in unique talent and nurtures it to allow it to succeed or do you try to create positions that are defined by a set of duties that can be done by anyone? Myatt’s argument is counter to what Linchpin is all about in its approach. If you create standards and clearly defined roles and evaluate solely based on those standards, which is the position that is being argued from, you will suffer under a linchpin promotion strategy. Maybe. At least, your business model will suffer. But that misses the bigger point: Why build an organization around such a model to begin with? Maybe the system needs to change as much as the individuals within it. Maybe then, a linchpin promotion strategy doesn’t look so strange or problematic. Seth, who I’ve been celebrating this week, had it right. Many of us fear the stuff that works, because in a complex world, innovation is what often works to solve problems instead of the same way we’ve always done things. In a period of accelerated change, information abundance and overload, and hyperconnectedness, the fear that one is losing their place is palpable when you speak to those over the age of 40, and many below that age. Indeed, what Kushner was speaking about was how fear leads to anger and hate and the suffering that it causes. My colleague Izzeldin Abuelaish, his work, charity and campaign is all about removing fear and promoting understanding for peace. In an interview with TVO he spoke to this issue how the fear and hate associated with a complex issue like the Middle East relations cannot be made to interfere with our fundamental knowledge of what it means to be human. And being human is increasingly complex. The Middle East, new technology, and a rapidly changing society all reflect a more complex world. Complexity, by its very nature, produces unpredictability and instability. Yet it is in complexity, the boundaries between systems and ideas, and channeling diversity that we innovate. Innovation, by definition, is doing something new to produce value. New means challenging the status quo by default. Resistance to ‘new’ is so easy to see everywhere and the lesson of Darwin and paleoanthropologist Richard Leakey taught us is that a failure to adapt results in extinction. So if we do the math, complexity leads to fear and fear prevents innovation and that leads to extinction. It is why people like Seth Godin write “Linchpin” and speak on standing out as the means of survival. It’s why Peter Diamandis had such trouble raising the funds to support the X-Prize from organizations, yet found dozens of teams interested in competing for it(a great set of stories about the Prize and innovation are included in his talk on TVO’s: Big Ideas). 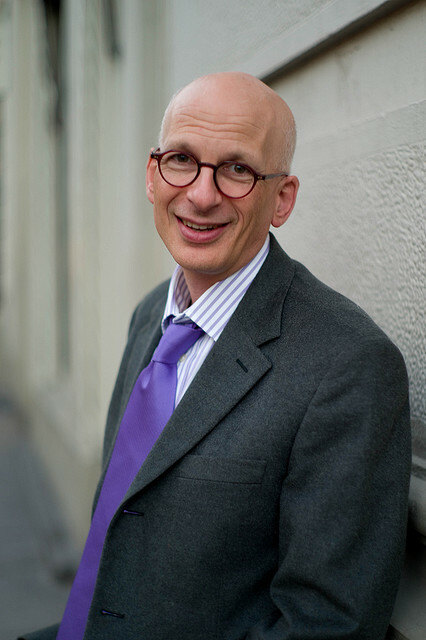 In both cases, the audience is the individual and small teams or tribes as Seth Godin puts it. From this it seems that there are a few courses of action that won’t ignore complexity (contributing to what management theorist and systems thinker Russell Ackoff described as ‘doing the wrong thing righter’ ), help spur innovation, reduce fear and hate as a result. 1. Teach systems thinking and complexity science in schools, the community, in the media. By understanding how things come together, the unintended consequences and opportunities that emerge from systems, the complexity is reduced or at least made less mysterious in a manner that invokes fear. 2. Provide people with opportunities to develop the analytical skills to make sense of complexity. John Mighton’s work at JUMP Math is a great example. He teaches people to enjoy mathematics and how to learn about it and use it everyday. Math and number fear is (in my opinion) one of the most significant barriers to people understanding complexity. If you fear numbers, you’ll hate math and statistics, and you’ll not want to learn about things like stochasticity (randomness) and risk. 3. This includes working together — experts and non-experts alike — to create the tools necessary to anticipate change. Having a sense of what might reasonably happen (using the aforementioned skills) reduces anxiety. As Kushner recalls, people who are about to die don’t fear death, they lament the life they didn’t live because of fear of the unknown. 4. Nurture individuals and teams because those are where real relationships form. Networking large organizations is fine, but it is in building relationships between people and the small tribes they form that will create the trust and goodwill to allow people to be open and transparent. And this transparency and openness reduces fear. 5. Encourage people to use – and learn from — tools that help people form relationships, maintain them. Social media tools that can’t break are ones that allow people to try and fail and learn. Without a culture that supports relationships and encourage wild attempts that might fail, innovation is unlikely to follow or be sustained. Anything missing from this? Anything off the mark? Don’t let fear dissuade you from innovating and making this better and different.